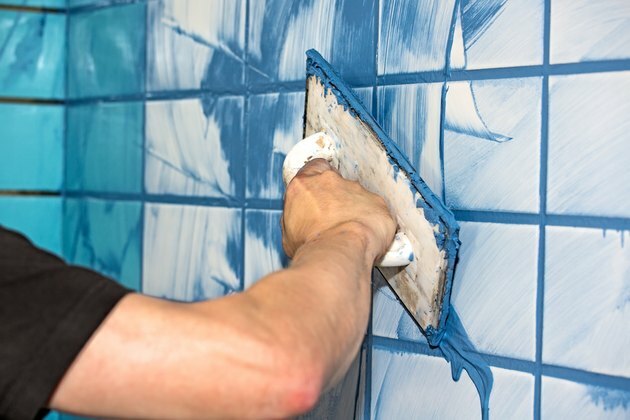 As with untinted grout, colored grout develops a buildup of soap scum, mineral deposits or even mildew over time, especially in a damp environment such as the bathroom. Cleaning grout that has an added tint requires a little extra care, as certain chemicals might permanently bleach the grout. For best results, clean grout with a paste made of baking soda and regular tap water or peroxide. 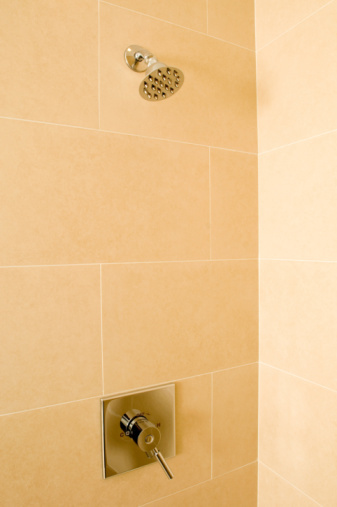 The grout in a shower is one of the most susceptible to discoloration, as it's subjected to lots of moisture and scummy residue from soaps and shampoos. This environment takes its toll on grout and the tiles in the shower if not cleaned regularly. For starters, try cleaning colored grout in the shower area with a stiff nylon-bristled scrub brush and water. If scrubbed every few weeks or so, the grout should stay relatively clean. Cleaning grout with bleach isn't an option as it may affect the tints used to color the grout. For a little more abrasive action, apply baking soda to the bristles of a nylon scrub brush instead. Scrub the grout with the baking soda, reapplying more as needed. For areas that look really dirty, mix up a paste of baking soda and water, dab the paste over the grout and let it sit for 10 minutes or so. After scrubbing, wipe the grout down thoroughly with a wet sponge to remove baking soda residue. For mildew or tough stains that aren't scrubbing away with other methods, whip up a homemade grout cleaner made of peroxide and baking soda. Pour a little peroxide into a bowl, then mix in an equal amount of baking soda, adjusting the mixture as needed until it makes a runny paste. Test the paste by applying it to an inconspicuous area of the grout first to ensure it doesn't bleach the tint out of the grout. Dip a damp scrub brush into the paste, scrub a small area of grout with it, then wipe the grout down again with a damp sponge. The combination of peroxide and baking soda should remove discolorations caused by soapy buildup, mold or mildew. Vinegar is an excellent all-purpose cleaner that's safe for most surfaces and doesn't contain the toxins found in some chemical-based cleaning products. Remove mold, mildew and film from colored grout by spritzing it with a mix of one part white vinegar to two parts water. Scrub the grout immediately afterward with a damp nylon-bristled scrub brush, then rinse the grout by wiping it down with a wet sponge. Vinegar is best used only once in a while on any kind of unsealed grout as it could degrade it over time if used often. The vinegar solution also removes soap scum from tiles, so feel free to use it to wipe down the walls and floor of the shower. Use a sponge to wipe everything down, then follow up with a sponge that's wet with only water. Dry the shower stall afterward. Don't use vinegar or other acidic products to clean tiles made of travertine, marble, limestone or other unsealed, soft stones, as the acids can eat away at the stone. An oxygen bleach powder offers another way to clean colored grout. Mix the powder with enough liquid to make a paste, dip a damp scrub brush into the paste, then scrub the grout with it. Once clean, rinse the grout with a damp sponge. As with peroxide, test the oxygen bleach in an inconspicuous area first.